Electronic media once seemed destined to reduce the use of paper. This certainly environmentally attractive idea is proven wrong daily in any office or home trash-bin. It simply doesn't work. We seem to need the paper. 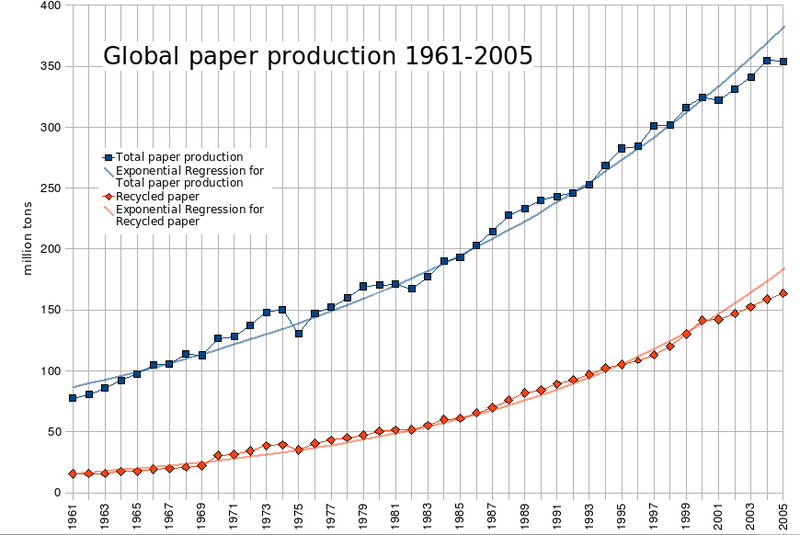 This impression of paper-crave is backed-up by studies that show an ever-increasing paper-production (and accordingly -consumption). We are doing ok reading a book on kindle, pad or laptop. It is fine for the subway ride to work. It works for leisurely reading a finished text. But if you have to thumb through a financial report of your institution or the first draft of a thesis of one of your students, you want to have it printed out. On paper. You rummage for a pencil. Why can't we stop printing what we see on our screens? Correcting, annotating, highlighting seems just more natural when done with pencil on a sheet. The ever-increasing number of document-modification software that allows for quite nifty scribbles and conversions on your screen-displayed documents is nice but it has not significantly reduced the urge to print. Once printed we scribble on our documents and then what? The stuff has to get back into our files. Some hand it to the secretary to deal with it, others scan, convert, retype… this is not, well, ergonomic - to say the least (it is outright annoying). One application will pop up soon - if anybody just codes it. I still wonder why it is not on the market yet. People would kill to get it! As I don't find time or skill to code it myself I just give the idea away and hope for the best (if one of you wants to write that software, and is able to do it, contact me - we will work something out along the line of: just mention me favorably and give me a free copy, willya?). You've heard of the input-device that traces what you write with a propped-up pencil on conventional paper and allows you to import it into standard graphics-software (Wacom is promising to have the so-called Inkling out in March)? It uses some infrared and ultrasound sensor that you clip to your paper-notepad. So when you write on that paper you end up with two versions of your scribbles: one conventional (ink on paper) and another, well, also conventional (bitmap, vector-graphic, jpg,… in your computer). Why not combine that with your document-reader? You read a manuscript (a pdf, maybe) on a screen-device. Then you decide to really work on it and print it out, because it just feels more natural to work on a paper-version. To that print-copy you clip the scribble-sensor, do some clicks to have orientation and size of the document right and then you start making your comments and alterations with real ink on real paper. What you do there, however, is recorded and transferred to the original file, creating a modified electronic copy. Either as hand-written annotation overlay to your pdf - or converted to text by some text-recognition software. Dear Carsten, idea-sparkler :-), as you say, paper is easier to handle. The difference between paper handling and on-screen editing/reading can, in my opinion, be said with one term: resolution. While in "reality", doing things with paper, pencil, your body etc. is a hi-res (or more exact: analogue) matter: There is no grid or pixel number to restrict your moves, your remarks, their form etc. - in contrast, on-screen reading and editing is low-res: There are so many restrictions how to move which device where to mark this in that way etc., it's extremely structured, in comparison (like a low-res screen is for graphical content, amongst others) and therefore, it's *not intuitive* - the principal disadvantage compared to free editing on paper. Now what you try is to have the free, hi-res handling/editing of content you have in the "paper realm", but at the same time to overcome the certain additional work to manually translate the freeer paper results to the restricting screen editing. But can this shortcut be taken? In my opinion, the translation from free paper work to online-editing must be done anyway. Up to now, you translate e.g. certain symbols or personal underline modi from paper work to the screen work by *fitting it into* the restricting screen conditions. E.g. a quick spiral with two big letters "Br" on paper, which here may stand for "More brainstorming in this aspect, please!" or a quickly-drawn arrow on the paper, meaning "Move this paragraph 1 paragraph down!" are being translated e.g. by short words and less graphically in many cases, or ad hoc by the application of the noted "command" (here: a moved paragraph). Now when, according to your idea, you write on paper freely, while at the same time, this is put as an overlay into the machine, I think the only difference is that your notes can somehow be overlayed and immediately compared on-screen - what up to now you also do, but with your eyes wandering from the paper lying before you to the screen. Your overlay method, also with character recognition, must still do the work to transform the text on screen to take effect. In the usual way, you also can apply paper notes directly to take effect or use a quick "inter-noting" as shown above (spiral becomes short word etc. ), but as this "inter-notes" are like milestones of (translation) work in progress, they're not really wasted time, I think: You shortly have to think about the appropriate low-res form of a hi-res (paper) not in this case, but that's quickly done - and at the same time, it's part of the editing process already. So the difference lies more or less in the eyes wandering in the usual way (which can be lessened by a paper holder right besides the screen, doing good to the eyes perhaps because of not permanent watching the same display); and in character recognition - which might pose problems: because I seldom would like to intervene (coded) characters from a correction overlay into my "serious" (or holy ;-) ) text - and also because these notes are often short anyway and partially(?) near-unreadable ;-). I will not say much after the last comment..except I like the idea.